(center) Mark Chao, Ethan Ruan and Rhydian Vaughn in Monga. With Monga, director Doze Niu takes familiar genre elements and polishes them to a proper shine. Niu doesn't reinvent the youth gang saga, but the effective commercial storyline, Taiwanese cultural specificity and solid cast make the old seem new. by Kozo: You've seen Monga before - but not exactly like this and that makes all the difference. Director Doze Niu's (What on Earth Have I Done Wrong?) youth gang film possesses solid situations and characters, and does a fine job of walking the thin line between glamorizing and criticizing the gang lifestyle. The story does seem familiar, but that's because every culture has their version of the youth gang saga. Sometimes a regional film industry will even produce new versions for successive generations. Well, Monga is the Taiwanese gangster film for the now generation, tapping into nostalgia and nationalism while also representing the country's reinvigorated commercial film industry. Well made and very entertaining, Monga is only a miss if you absolutely abhor this genre. I'm guessing that you don't. Mark Chao of hit Taiwan drama Black and White stars as Mosquito, a lonely teen who's just moved to Taiwan's Monga (Wanhua) district circa 1986. When bullied by the local toughs – they're after, of all things, the roasted chicken leg in his lunchbox – he fights back instinctively. Mosquito isn't a rebel nor is he trying to upset the status quo – he just dislikes being pushed around. Soon, Mosquito is threatened with a five-on-one beatdown, but he's saved by the intervention of another gang led by the mullet-sporting Dragon Lee (Rhydian Vaughn of Winds of September). 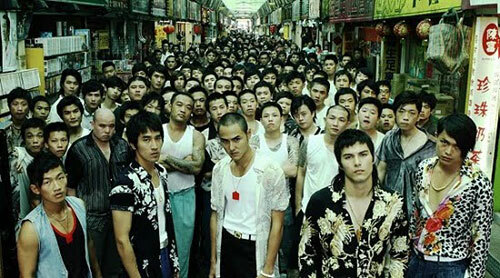 Dragon's group is composed of your standard youth gangster types – Monkey is short and a scrappy fighter, A-Po is the dopey comedy relief, and Monk (drama idol Ethan Ruan) is strong, stalwart and easily the most charismatic of the bunch. Together, the five friends form the "Prince Gang", reveling in their newfound camaraderie and the shared joy of running around the streets and getting into fights. It's all so precious. Monga starts in sharply entertaining style, with smart black comedy, fantastic camerawork (from cinematographer Jake Pollock of The Message), and some lyrical, imagined touches that take place in the mind of neophyte gangster Mosquito. The character serves as the audience's touchstone, introducing the Monga gang life in an engaging manner. Mosquito's attraction to this life is easily understood; he has no father and few friends, and his mother maintains ties with a former mainland boyfriend (director Doze Niu) who Mosquito instinctively dislikes. Getting the audience to buy into Mosquito's character is easy; Mark Chao is innately identifiable, and Ethan Ruan so adeptly inhabits the charismatic (and possibly homosexual) Monk that it's easy to see why Mosquito idolizes him. As Mosquito's scarred love interest, Ke Jia-Yan (Miao Miao) is quietly alluring. For Mosquito and the audience, joining the gang seems like good times all around. That is, before reality crashes in, sending the boys' idealized life hurtling towards a tragic end. As time passes, Mosquito finds a new parental figure in Dragon's father, ebullient gang boss Geta (Ma Ju-Lung of Cape No. 7), but there may be hell to pay in his growing affiliation to the gang. Director Niu lays the groundwork for that theme in one potent scene – involving a Taiwan-style breakfast, a pair of chopsticks and a severed finger - that wordlessly conveys the black reality of the gangster life. Being a part of jiang hu means establishing a reputation but also making potentially disastrous mistakes. The Prince Gang inadvertently plants seeds for later grudges, while also uncovering older, hidden secrets that could be more dangerous than anything they cause themselves. These plot points don't deviate from expected genre clichés, but the human emotions strike the proper chords. Who hasn't been young, flawed, and looking to belong? Surely most of us, and in those themes, Monga easily affects.